The Globe earns national awards from College Broadcasters, Inc.
Goshen College broadcasting students and 91.1 The Globe (WGCS) again won first place in two categories and were named finalists in one other category in the College Broadcasters, Inc. (CBI) National Student Radio Production Awards, which recognize the best in student radio production across the nation, at its national convention last weekend in Minneapolis. 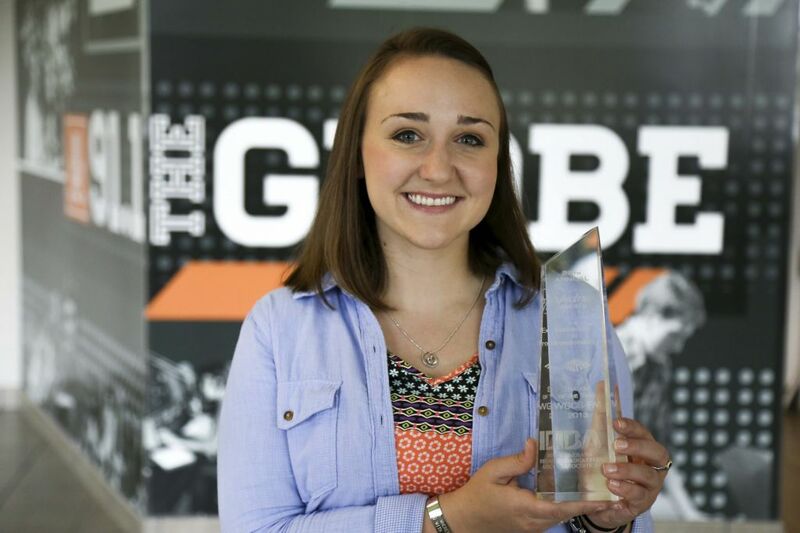 Danielle Kerschhackl, a senior broadcasting and American Sign Language double major from Elmwood Park, Illinois, was named “Best Audio DJ,” and the station won first place for “Best Audio Newscast” with Globe News, which featured Berke Beidler, a sophomore broadcasting major from Lancaster, Pennsylvania, Quinn Brenneman, a sophomore broadcasting major from Goshen, Karina Flores, a junior broadcasting major from Goshen, Riley Mills, a sophomore broadcasting major from Milltown, Indiana, Andrew Snyder, a junior broadcasting major from Goshen, and Brad Stoltzfus, a sophomore broadcasting major from Goshen. Among The Globe’s other accolades are the Intercollegiate Broadcasting System’s (IBS) “Best College Station in the Nation” award in 2011 and 2013, the first college or university to repeat in that category, and was runner up in 2012 and a finalist in 2014. Goshen College was also named Indiana Radio School of the Year in 2012, 2013 and 2014 by the Indiana Association of School Broadcasting (IASB).